One subset, the larvaceans, are pelagic. These animals construct a mucous net around their bodies with a well-defined set of openings at both ends. 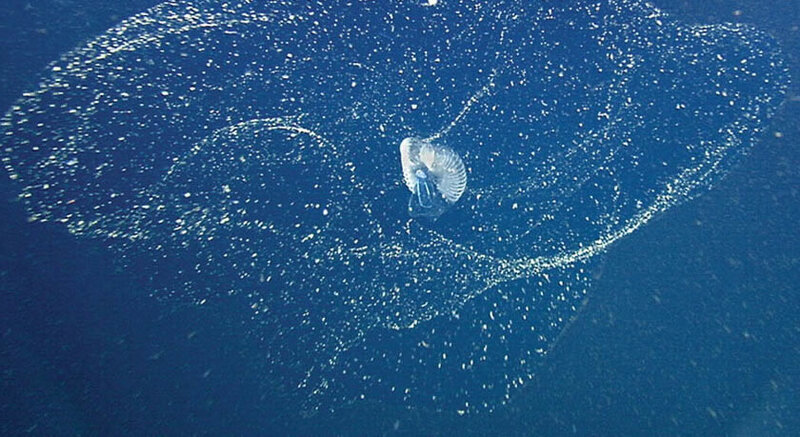 They consume it as it becomes clogged with plankton, and their mucus is another important component of the organic detritus that feeds the deep oceans. Another rather imposing urochordate is the salp. These animals are colonial, building tube-shaped pelagic colonies that can be many meters in length and comprise hundreds or thousands of individual animals. Each animal is about the size of a mandarin orange. 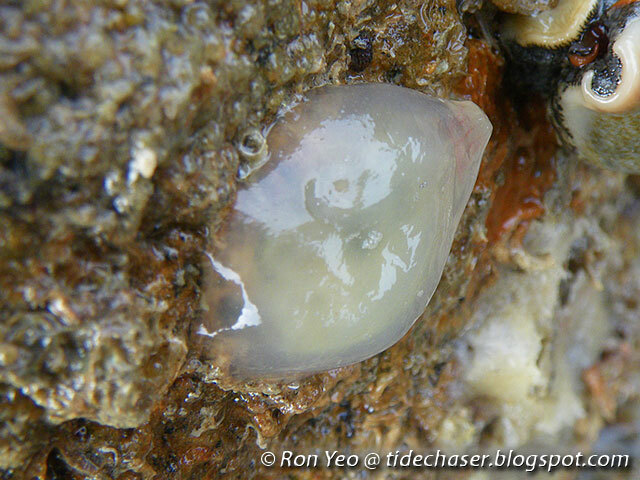 The best-known urochordates are the group affectionately dubbed “sea squirts” for their habit of spitting water at beachgoers who poke them. This is not a nice thing to do, as sea squirts on land are generally waiting for the next high tide and rely on that water to breathe until then, but it does tend to distract and confuse creatures that might otherwise try to pry them from their rocks. Other sea squirts are not quite as bland as this typical example, and instead show the radiant colors that typify tropical reef biota. Opposite to the chordates, echinoderms began with other lifestyles and developed filter-feeding habits late in their evolutionary trajectories, echinoderms got their start as filter feeders. The well-known modern groups only later developed the predatory and substrate-feeding strategies for which they are known. The quintessential filter-feeding echinoderm is the crinoid, or sea lily, whose kin dominated entire reefs in the Paleozoic era. This creature consists of a forest of feathery arms on a long calcareous stalk that serves as a holdfast. Modern sea lilies live only in deep oceans, rarely seen by unaided human eyes. Unlike the sea anemones it superficially resembles, the sea lily has very limited movement modes. Its stalk is made of its skin and body wall, and has no locomotor functions. If a sea lily is tipped over or desires to find a new home, it must drag itself along the seafloor using its arms, a somewhat pathetic sight. Not all crinoids are so limited. Tropical reefs have their own crinoids, known as the feather stars and lacking the sea lilies’ distinctive stalks. These brightly colored animals are, like their deep-sea kin, filter-feeders. Unlike their deep-sea kin, they are powerful swimmers, flapping their dozens of arms in waves to paddle about and using their long, central tube feet to hold themselves in place when they arrive. Both more familiar and more alien are the basket stars. Kin to the brittle stars that populate many marine aquaria, the basket stars have arms subdivided many times over into a huge net of tentacles that they use to seize small crustaceans and bring them to their central mouths. The one in this video has been fed brine shrimp and sped up to show the movements more clearly. It is an absolute travesty that these three animals aren’t better known. Such weirdness must be broadcast across the world. The animation of this creature is raised dramatically in the brittle stars. So named because of the ease with which their arms break when the animal is grasped roughly, these creatures are much more active feeders than other echinoderms. With their lashing arms, brittle stars can move about at surprising speed, changing directions instantly and wrapping their arms around prey to bring them inward. Around large food items, groups of them can form tangled feeding frenzies, each trying to drag the entire item away to feed at its leisure. …but allows us to watch the animal insert its stomach into its prey mussel and digest it inside its own shell. Another, less intense look at the stomach is here, on a scavenging sea star that dissolves the mulm off of its aquarium glass. Many echinoderms use the tube feet on their arms to bring food to their mouths. Sea stars, which usually use those tube feet to walk and therefore bring their mouths to their food, are rarely a good example of this feeding mode. These sunflower stars are uncharacteristically feeding at the surface of their enclosure, and switch to moving their food toward the mouth the moment this is more convenient than chasing sea urchins at ground level. Notice also how the sunflower star has divided the standard echinoderm pentaradial plan into many, many more arms than that (3-5 per ancestral arm). Any series like this would be incomplete without a treatment of sea stars’ famous regenerative capacity. Effectively, pieces of central disc above a vaguely-defined size can regrow any missing parts, up to regenerating about 4/5 of their entire bodies. This means that being divided into pieces, as was briefly a common means of trying to reduce sea star populations near oyster beds, is actually a form of asexual reproduction that rapidly increases population. As long as enough of the sea star remains that it can still eat to sustain its growth, each such piece can grow into a complete new sea star. Sea stars get a lot of attention even outside of biodiversity surveys like this one because they are often highly important to their ecosystems. In tide pools, they are often top predators whose pressure on mussel populations keeps the mollusks from completely crowding out everything else. Their low metabolic rates also mean that they are quite capable of adapting to very low-energy environments, such as the Antarctic shore. Everything moves slowly when the temperature is consistently near the freezing point of freshwater, or colder. Here, though, sea stars face an altogether more dangerous hazard. When sea ice forms, it excludes from its expanding crystals the salt in the water. This creates a plume of hypersaline water with a lower freezing point immediately adjacent to the new sea ice. This water then sinks to the bottom and cools the adjoining ordinary seawater to freezing (and creates more hypersaline water…) all the way down. The end result is a snaking tendril of underwater sea ice that eventually reaches the bottom and spreads across the seafloor until its cold is completely dissipated. Eventually, the ice is broken up by waves or melts on its own, but that generally takes too long for the sea stars and other scavengers trapped by the speeding cold. In the tropics, another sea star is of increasing ecological significance. The crown-of-thorns sea star (Acanthaster planci) is up to 30 cm in diameter, covered in venomous spines, widely distributed across the Indo-Pacific marine environment, and is a specialist predator of stony corals. For reasons probably related to anthropogenic climate change, its populations have increased dramatically in the past 20 years, leading to widespread damage to coral reefs already stressed by increasing sea levels, acidifying water, and increased disease incidence. Crown-of-thorns sea stars don’t appear to be affected by the Densovirus outbreak, perversely enough. The reason this video series is so long is that, for the past several years, the space taken up by dissecting an Asterias star has had to be filled in other ways. A viral outbreak has caused a large-scale population crash across many sea star species in several oceans, including the Atlantic Asterias populations from which the dissection specimens were customarily taken. This virus has gruesome results, destroying the bodily integrity of sea stars from the inside. When an affected sea star tries to pull its body along the substrate with its arms, the arms instead rip themselves off of the central disc and wander away. Without a central disc and with a huge parasite load, the arms cannot regenerate into new stars and eventually starve; without its bodily integrity and with a comparable parasite load, the central disc also dies. Students benefit from some levity after that. Fortunately, I recently found this bit of cuteness and couldn’t resist including it. At the Scripps Aquarium in San Diego, someone managed to film an encounter between a burrowing blenny and a sea star. The blenny did not want the sea star in its burrow, and gently resolved the intrusion. The fish swimming around are shrimpfish, which look straight down at the substrate to hunt for invertebrates while doing their best kelp impression. Rather than crawling close to the ground, the sea pig’s tube feet are thick, elongated structures that enable it to walk with its body held high. Its oral tentacles are directed downward, allowing it to snuffle through the substrate for its food, in rather porcine fashion. I’ll leave the reader to search for even stranger pelagic sea cucumbers on their own. That would be a satisfying ending note, but it wouldn’t be the echinoderm lab without a nice dose of gross and weird. The sea cucumber fits that bill nicely. The sea cucumbers are a surprisingly diverse lot, featuring pelagic, substrate-feeding, and roughly sessile filter-feeding members. Some of them look like animate feces, others like obese flowers, but one thing that almost all of them have in common is a truly bizarre defense mechanism. Sea cucumbers are far too slow to run from predators and usually lack long, easily shed limbs like other echinoderms, so they defend themselves by dumping organs at their predators through their anuses. In the most primitive sea cucumbers, these are usually the intestines, and the predators are, with any luck, satisfied with eating those and leave the sea cucumber alone to regenerate. More advanced sea cucumbers instead excrete specialized sticky tubules that clog up a fish’s gills and otherwise put the predator in danger, or fill those discarded intestines with poison. The key to this strategy is the echinoderms’ famous regeneration, which enables the sea cucumber to regrow the lost material in a few days or weeks the same way a sea star regrows its lost arms. Few vertebrates can match that healing factor, but vertebrates have more than enough quirks of their own. Those, we’ll see next time.